A tornado hits a town in Xindian District, Taipei County, Taiwan, flipping a few vehicles but causing no casualties, according to local media. The China Post news staff -- Many people in downtown Xindian (新店 in New Taipei City could not believe their eyes when they witnessed a tornado, an extremely rare phenomenon on the island. The 20-floor high tornado lasted about two minutes and hurled objects in its path into the air in downtown Xindian, including some trees. A van was lifted from the ground and smashed a motorcycle when it fell. No casualties were reported. “It's the first time in my life that I saw a tornado,” said a local witness, who was woken up by the swirling storm. The whole process of the tornado's formation and disappearance was recorded by a local resident, who posted the video on YouTube. According the Central Weather Bureau (CWB), the storm will not be included in the official record of natural disasters as it was not recorded by the bureau's weather station. As the local insurance industry usually relies on CWB records for damage claims, the ill-fated owner of the brand-new van may not be able to receive compensation for the damaged vehicle. According to the CWB, the violent storm may have been caused by strong thermal convection, a process when cold dry polar air meets warm moist tropical air. 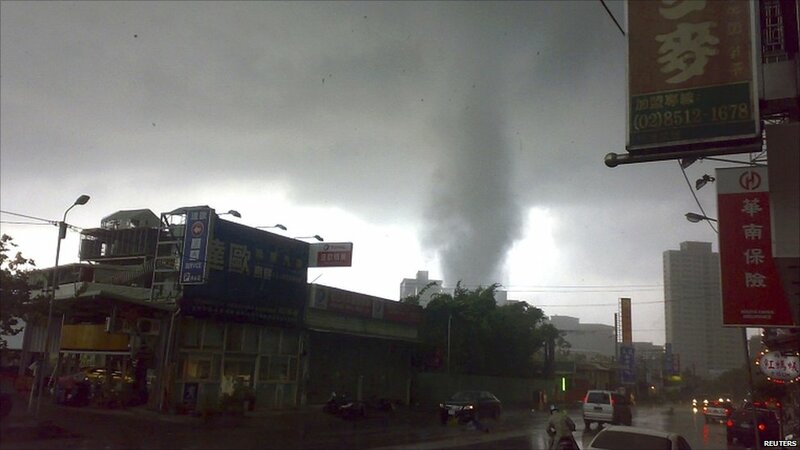 While typhoons are common tropical storms in Taiwan, the occurrence of tornado in Taiwan is extremely unusual. A tornado is a violent, dangerous, rotating column of air that is in contact with the surface of the earth. Tornadoes come in many shapes and sizes, but are typically in the form of a visible condensation funnel, whose narrow end touches the earth and is often encircled by a cloud of debris and dust. Most tornadoes have wind speeds less than 110 miles per hour, are approximately 250 feet across, and travel a few miles before dissipating. E' un fenomeno assolutamente inusuale e storico per Taiwan!